"The Anatomy of Desire" brings together over ten years work and research into a variety of expressions of desire. BOURNEMOUTH.- text+work, the Arts University College at Bournemouth announced "The Anatomy of Desire", a solo exhibition by Charlie Murphy that examines forms, issues and dialogues of intimacy through sculpture, video, music and live art. The exhibition is complimented by a publication with three incisive texts by Luce Irigaray, Alistair Gentry, and Leonore Tiefer. "The Anatomy of Desire" brings together over ten years work and research into a variety of expressions of desire. Since 1999, Murphy has been asking participants to donate casts of kisses and other intimate spaces to her project and has collected them from all over the world through her trademark kiss-in events and open invitations. 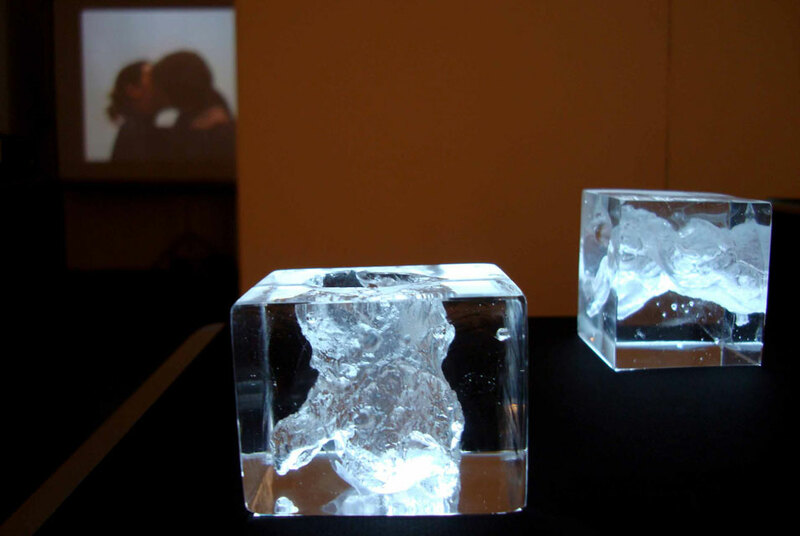 Asking couples, friends, and strangers to hold their pose for 90 seconds, she subsequently transforms their casts into glass sculptures through elaborate mould making processes. Now realized as a powerful installation of illuminated sculptures and video, this work will present an extraordinary survey of the kiss and a fascinating perspective on the hidden forms of desire. Kissing one another is as much birth as mourning in a way, but it is a path that can lead us to what would be eternity, a shared eternity. [Luce Irigaray] Set to an experimental soundtrack, Murphys mesmerizing video also offers a unique insight into the act and dynamics of the kiss, while the sound of kissing is conceptualized through percussive, electronic and choral instrumentation by emerging composer Jorge Queijo. The accompanying publication explores the problems of representation and language to describe these experiences. Specially commissioned texts, The Archive of Imaginary Interiors by artist and writer, Alistair Gentry; Towards the Sharing of an Invisible Touch by Feminist and Cultural Theorist, Luce Irigaray; and On Kissing by New York-based sexologist, Leonore Tiefer complete the text+work project. Charlie Murphy (RCA MA) is an artist currently based in London, UK, whose work includes photography, sculpture, video and participatory events. Her work has been presented in numerous galleries, museums, and art galleries, both in the UK and internationally, including the Venice Biennale 2005 and Tate Modern. She is based at ACAVA studios, London, and has been an ArtSway Artist Associate since 2003. NBC Universal Presents Bravo Reality Series "Work of Art: The Next Great Artist"
Austrian Artist Karl-Heinz Klopf's "You're Having a Laugh"